What does Japanese sound like if you directly translate it into English? Let’s talk about keigo. As a native English speaker learning Japanese means throwing out everything you know linguistically and basically starting from scratch. Vocabulary, sentence structure, writing, phrasing, and idiom. After living in Japan so long, especially after the 6 years of Japanese-only schooling, it seems my brain has decided to create a Japanese mode and an English mode in order to compensate for the differences between the two languages. If I go into Japanese mode, I end up sounding really stupid if I have to say anything complicated in English, like describing how something technical works, even if I can describe it normally in Japanese. My brain just says “NOPE.” and lets me down more often than not. I think I’m not alone when I say that simultaneous interpretation is, while not incredibly difficult with some practice, very tiring. It’s like your brain is playing a tennis match myself running back and forth to each side of the court to keep the ball in play. The Japanese language is so essential to understand how the culture works that I really believe that having a grasp on how real Japanese conversations work, even on the basic structural level, will lead to many insights into how Japanese people really feel about a situation, even if communication done in English or some other language. Direct translations (直訳) of Japanese is probably the cause for many of the hilarious or strange Engrish that is generally associated with Japan. (Fun fact: If you backwards engineer some Engrish to Japanese again, it will usually not sound so weird in its native Japanese.) I can kind of understand why that happens though… you can’t directly translate Japanese most of the time with a natural sounding outcome in English. I’ve thrown together a simple chart to explain a bit about keigo (敬語, polite language) because the concept of honorific and humble speech does not really exist in English in the capacity that it does in Japanese, and it is one of those things that does not directly translate well. 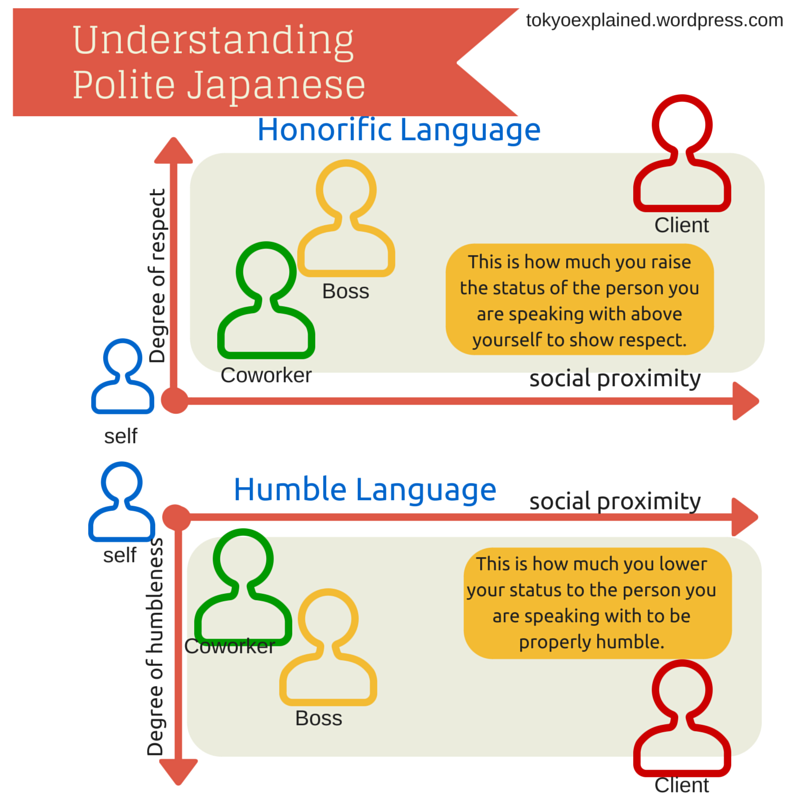 Many learners of Japanese stumble with keigo (myself included), but if you can figure out your social proximity to the person you are talking with, then it becomes easier to figure out what level of politeness you should try to use while speaking. Understand your place in this world, and all will be well. Just to further clarify what keigo actually sounds like, here is a template for a business email that I’ve directly translated into English without consideration of how the receiver (a native or proficient English speaker) would react to reading it. Formalities, honorific tone, vocabulary, and all that have been preserved while trying to be as grammatically correct as possible. This is completely normal sounding in Japanese. I am always in your esteemed care. This is ABC Inc.’s Suzuki Taro. and I am terribly grateful. Although the time was short, if we were able to humbly receive your honourable understanding for our firm’s ideas, and service’s merits, I would be happy. and I humbly will give you another esteemed contact tomorrow. I was humbly thinking if I could introduce information. This is simple, and just a hasty note to express my gratitude. From now on, I humbly implore you to treat me well. While in English I think for this email you would probably just keep it short and sweet saying something like “It was great meeting you today, thanks for your time. Let me know what you think.” Some people would probably be really annoyed to get a flowery, long email like the one above, regardless of your relationship to each other. However, in Japanese if you were to write something short like that to a new client, it would probably make the person on the receiving end feel uncomfortable and give the impression that you are unnecessarily blunt. We don’t want that now, do we? Intra-office marriage in Tokyo is more common than you think.